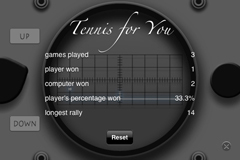 This game is similar to "Tennis for Two," the first video game ever played, before the era of electronic ping-pong game. 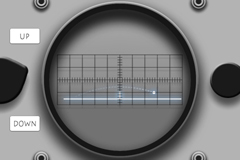 With the same good ol'oscilloscopic feel, this iPhone game is meant for a single person to play. Left side is the player, and right side is the computer. Hit the ball that came to the player side by tapping on the right side of the screen. 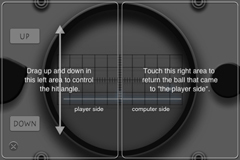 Determine the angle of the ball by dragging up and down on the left side of the screen. To see how to play the game, tap the "?" button that appear in left bottom part of screen in standby mode. To go back to game, tap the "x" button. To check game record, tap the "i" button that appear in right bottom part of screen in standby mode. Tap Reset button to reset record. To go back to game, tap the "x" button.